Research is just one of the aspects that makes University Park stand out compared to other business parks in the region. 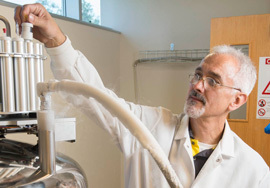 Faculty members work closely with students and businesses to foster innovation and their research can be enhanced through affiliation with the Park. The work SIUE’s nationally recognized faculty members are doing in tandem with students and businesses is yielding results—improving health care and positively impacting the technology industry. Faculty members and students thrive in a collaborative environment that facilitates mentorship opportunities. Start-up companies and existing businesses get the benefit of formulating partnerships and consultative relationships with faculty leaders in their fields.